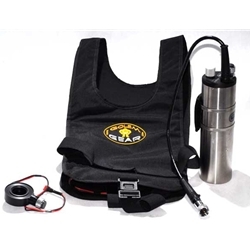 Q-Vest, drysuit heating system with 28Ah battery pack - E/O version. The bulkhead connector block is a combined inflator/bulkhead connector which comepletely replaces the drysuit valve (see manual for details). It has standard E/O connector whip - about 4 inches long. The stainless Steel battery canister has rotary switch and charging port. 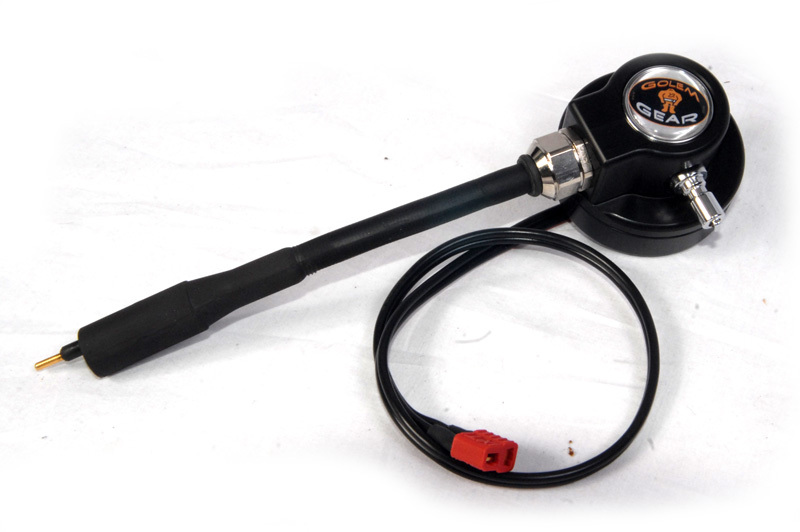 It is designed to mount on diver’s waist belt on the left or right side with standard E/O connector wet plug cable comfortably reaching the socket on the bulkhead connector block. The rotary switch on the battery canister allows diver to set three levels of heat output as well as to completely switch the heat off. The Q-Vest is powered by 12V 28Ah LiIon battery pack providing several hours of comfortable heat output.